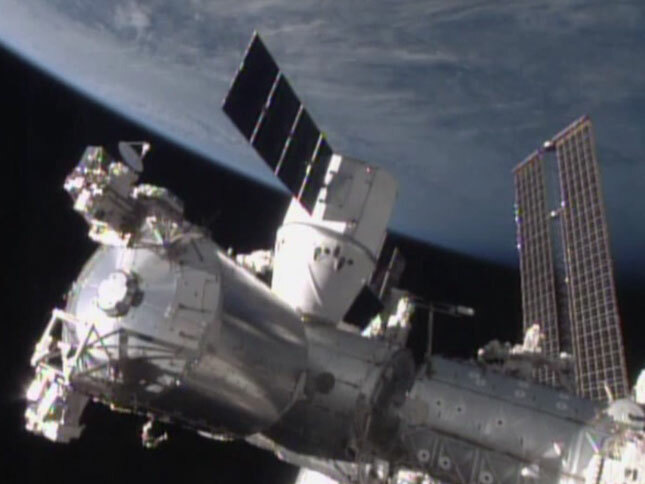 The SpaceX Dragon cargo spacecraft was berthed to the Harmony module of the International Space Station at 8:54 a.m. EST. The hatch between the newly arrived spacecraft and the Harmony module of the space station is scheduled to be opened Tuesday, but could occur earlier. The capsule is scheduled to spend four weeks attached to the station. Any specific reason why ‘opening the hatch’ is scheduled and not near-instant after successful coupling? The crew and mission controllers need to conduct pressure leaks, equalize the air pressure and ensure a tight connection between the spacecraft before beginning cargo operations. Great move to success . I’m the happiest man on earth watching and waiting for you and your talents to discover new: Drugs, techniques to help the whole World and the population who lie me not have a developed mind like you, We consider you real :”Sabios”=Wise man…Thanks for your Courage and the hope to make the good better and give confidence to the old and new generation…May be you feel alone up-there, and the true is: People like me see you when orbit the earth. The new space station I understand has biologic, technological laboratories for you to surprise us…Every time you landed on our planet has new information about climate,new discoveries far away from known Galaxies. I hope I can live long enough to see a new earth full of scientific advances:..You are the hand of God…Even do the part of one Galaxy has that name.Thanks.